Millions of Facebook users have changed their Facebook profile picture to honor Apple co-founder Steve Jobs who died yesterday from pancreatic cancer. According to Facebook, 628 million active users changed their Facebook profile picture to a real Apple, the Apple logo, or a picture of Steve Jobs. Actually, I made that number up. Well actually, I did a rough calculation based on my Facebook Newsfeed which shows that 11 out of 14 (78.5%) users in my Friends' list changed their profile picture to something Apple or Steve Jobs related. Wow! Just wow! 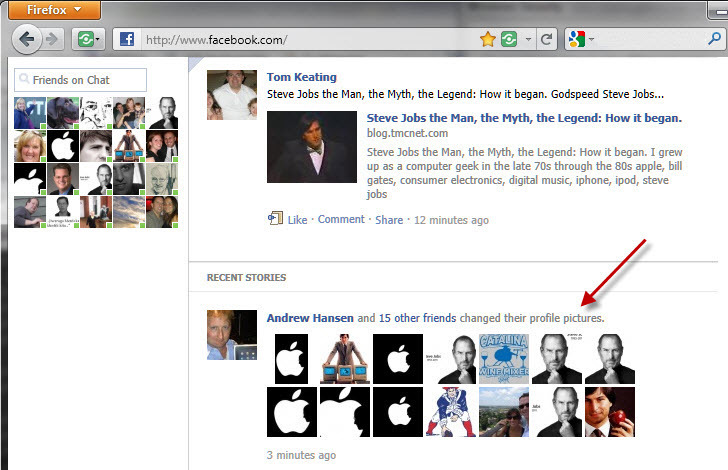 Look at how the majority of profile pic changes are Steve Jobs related. I bet this is a Facebook record of some sort. I don't know if Facebook has any plans to announce how many people have honored Steve Jobs with their profile pic or even if they have the capability to detect an Apple logo, real apple, or Steve Jobs' face. Wait a minute, what am I talking about? Facebook has photo facial recognition! Ok, Facebook, screw the privacy zealots and release the number of how many Facebook users changed their profile pics to something Steve Jobs-related. I'm sure even privacy zealots won't mind. Steve Jobs transformed technology and his legacy will not be forgotten. I will end this post by sharing an article I recently wrote titled Steve Jobs the Man, the Myth, the Legend: How it began.